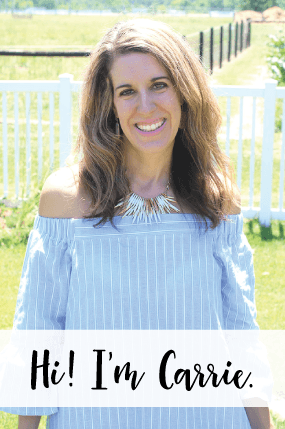 Today I am excited to participate in my first ever Holiday Home Tour with seventeen other bloggers! 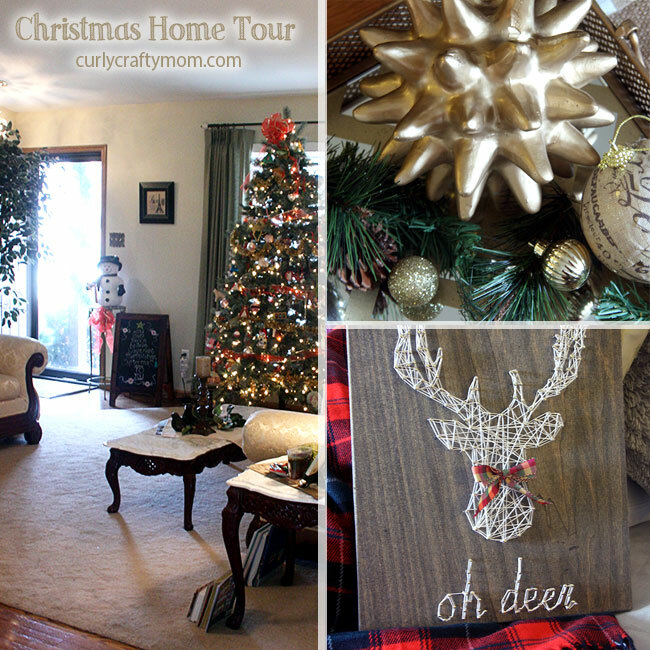 I have always done a home tour each Christmas, but I have never participated in one with so many other bloggers. 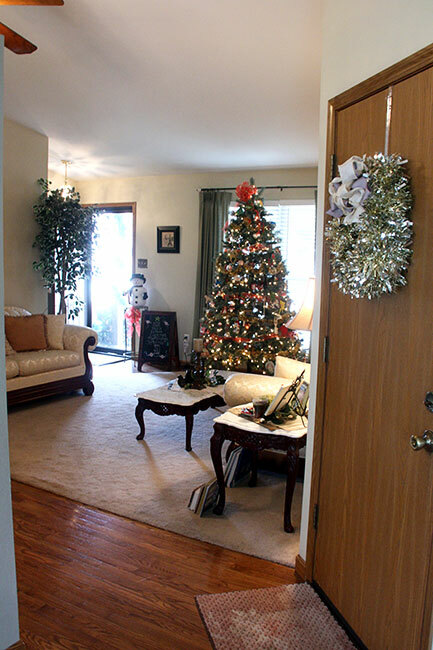 At the bottom of the post, you’ll be able to visit their Christmas Home Tours, too! Please stop by their pages to spread the holiday cheer! I decided to start the tour in my living room, because that is where our Christmas tree is! Next year I am thinking about adding a smaller tree to our family room, where our TV is located so we can have a matchy-matchy tree. 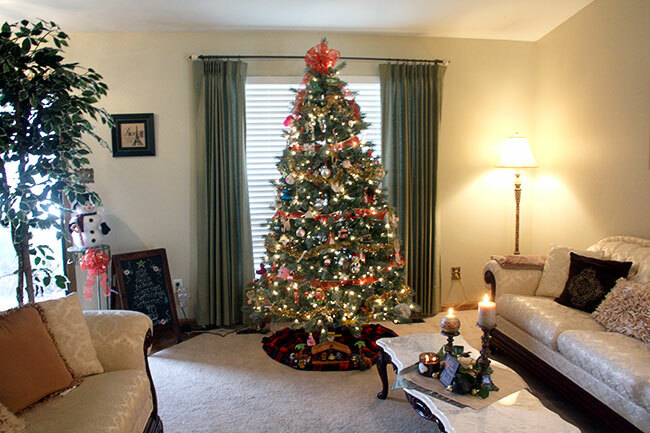 We always put our Christmas tree in the living room, because it faces the front window of the home and it is our fancier room. 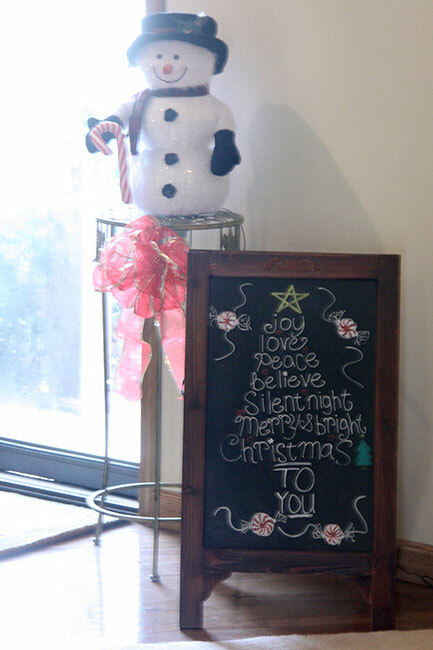 By the front door I put my chalkboard easel with our snowman. 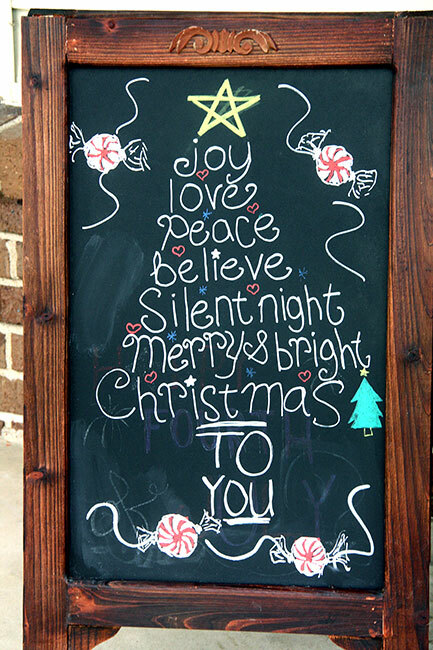 I decorate this chalkboard easel from Kirkland’s for EVERY holiday. LOVE it. Interior lighting can be SO tricky, so here is another photo of the chalkboard outside. I just placed it outside to get a better shot of it. I found this idea on Pinterest and quickly recreated it. 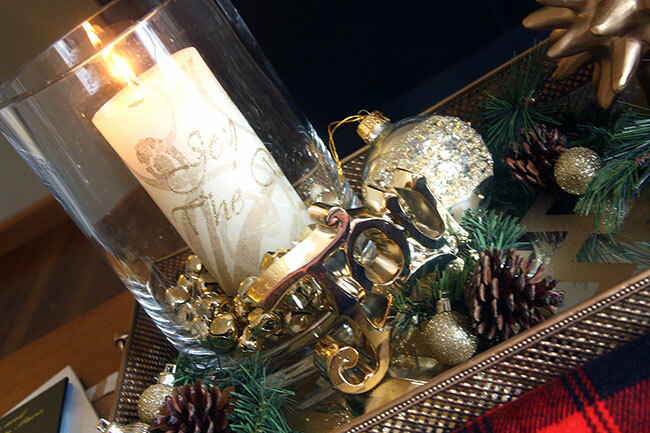 Sometimes I like to decorate around the ‘bones’ of the house… and, this is what I did on this table. 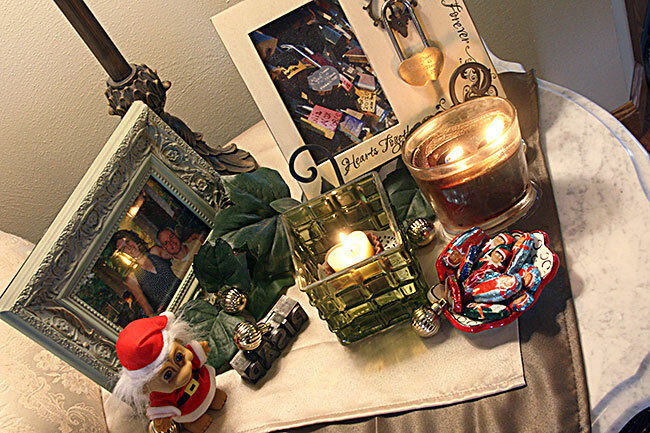 I added a few mini gold ornaments and one of my favorite candles (Fireside) from Bath & Body Works to the table. This year we had to buy a new tree from Lowes, because our 6 year old pre-lit tree would not light up in sections. This tree has sort of a flocked look (but, no mess!) and it really makes it look natural. Some of the lights on the tree are clear and some are frosted. It even has pine combs on the branches. 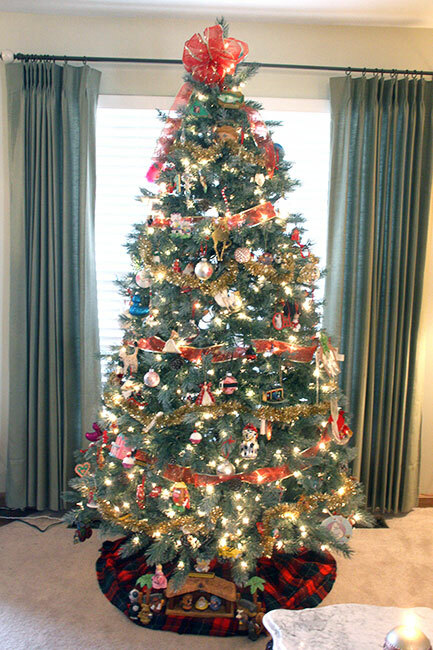 I do not miss our old tree at all!! I am currently working on making a burlap and linen ruffle skirt for our tree and it is VERY time consuming (but, not hard). SO, instead of showing our ugly and old tree skirt from Gordman’s, I decided to wrap a plaid throw around the base of the tree for the skirt. I love it. 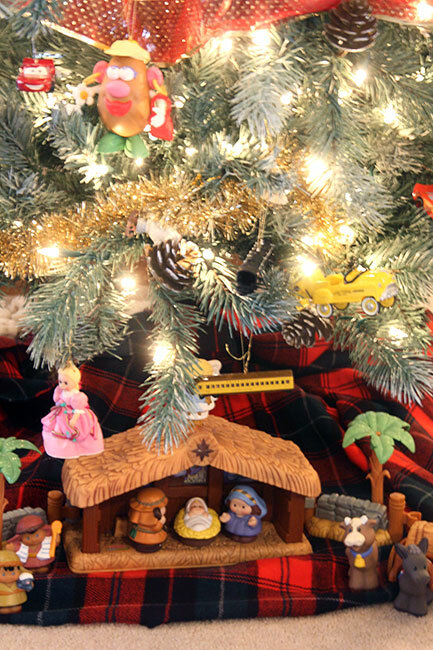 Here you will see our nativity set, my kids are 6 and 8, BUT we still use the Little People nativity set. You can also see a close up of the branches on our tree in this photo. 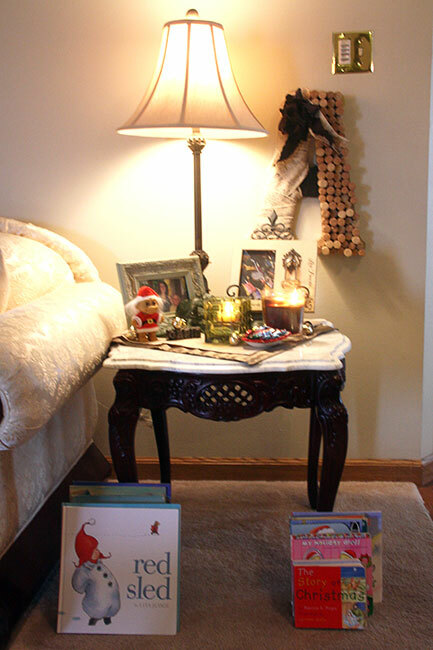 Here is the end table in our room, once again I just added some Christmas elements to it to jazz it up a bit. You’ll also see that I set our Christmas books out in front of the table. I had a little Santa key dish, but we never set our keys in it, so I filled it with some Elf on the Shelf chocolates. Yum! 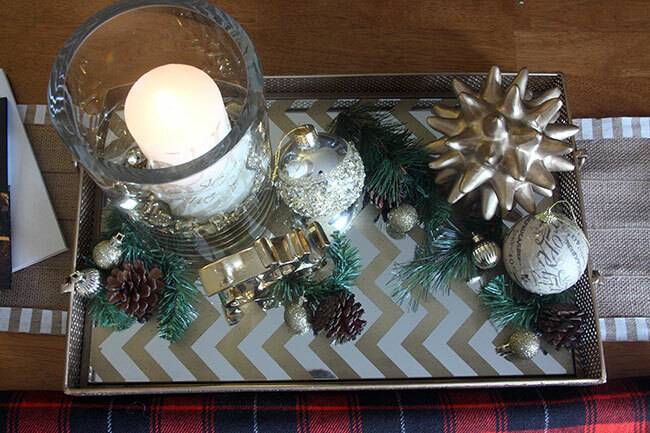 You’ll see I put some little gold ornaments here and there, just like I did on the coffee table. 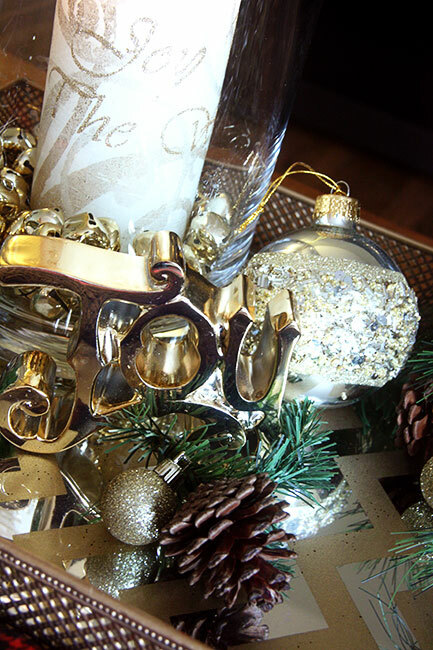 You’ll see these ornaments sprinkled all over our home to give it a little consistency. Moving right along… I wanted to make an interior wreath for our home and decided upon a gold and silver tinsel wreath with a golden initial. 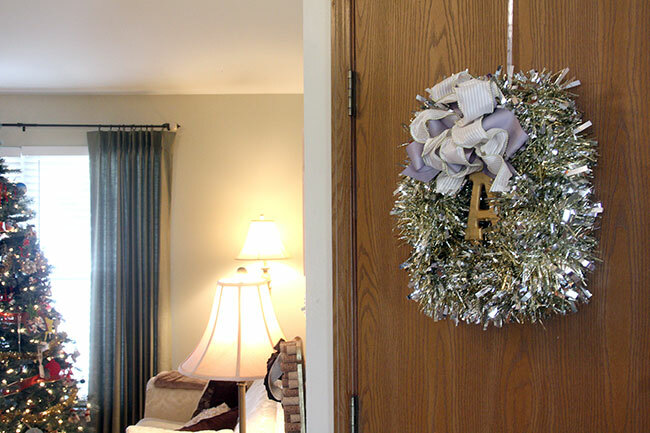 You can see the post I did about the tinsel wreath HERE. One last view of the living room, before we move to the family room. 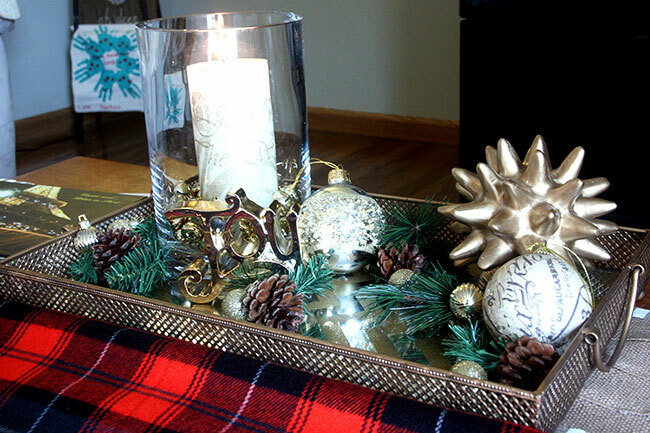 I just purchased this gold mirror tray from Hobby Lobby last fall and had pumpkins displayed in it. BUT, it needed something for Christmas, so I did a little more shopping at Hobby Lobby. 🙂 I decided to stay with gold and silver metallics, yet added a few greens and pine combs. 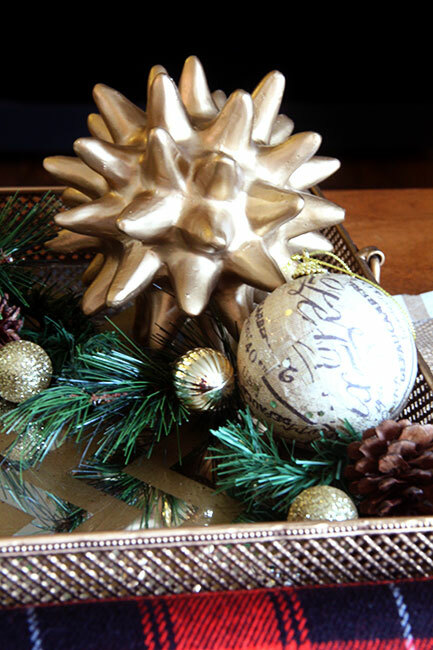 I have been eyeing this gold spiked ball at HobLobs forever… I finally purchased it when I saw that it was 50% off! What a deal! 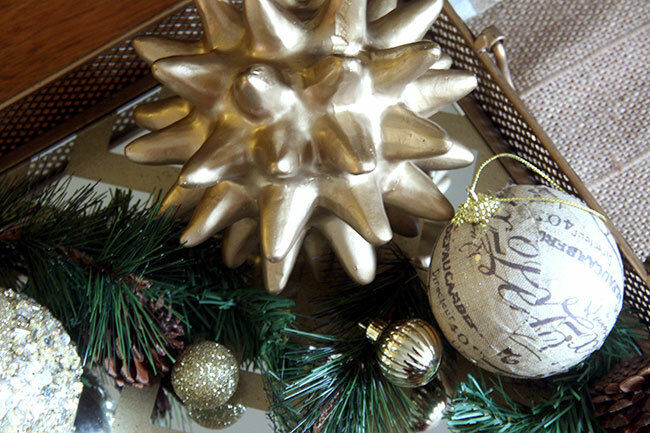 What is even better is that this spikey ball will work with most holidays, so I can reuse it! 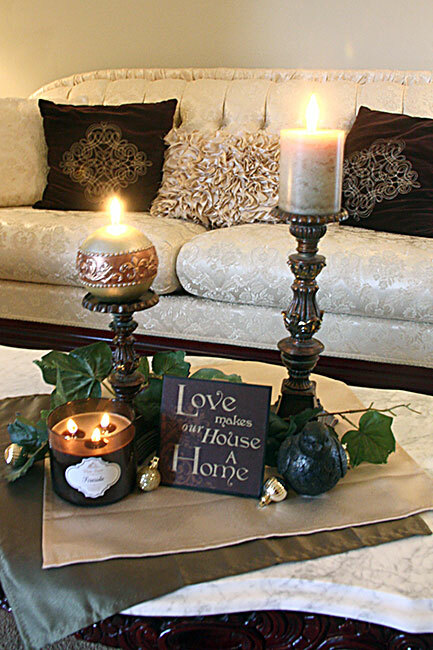 It is really not hard to find gold items at Hobby Lobby… I couldn’t find a battery operated candle that I liked, so I went with a real candle this time. 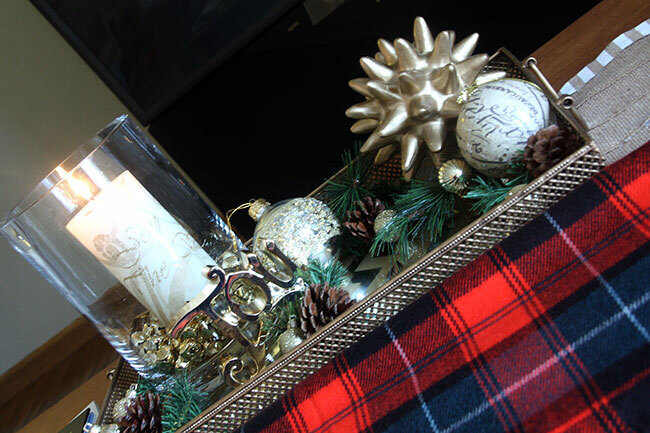 I found two really beautiful ornaments in gold/silver colors and then used the same smaller gold ornaments for the rest of the tray that I had used elsewhere in the house for fillers. And, isn’t the gold ‘Joy’ perfect?! 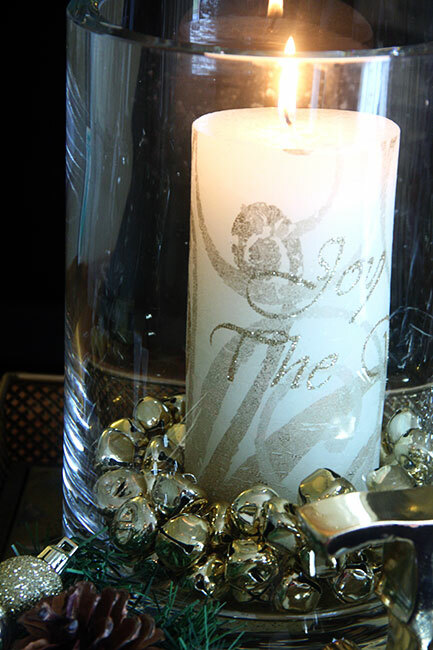 I put little tiny gold bells in the votive holder and they worked out really well… ok, enough photos of our new coffee table tray. 🙂 I hadn’t shared this on the blog yet, so sorry for the overload! 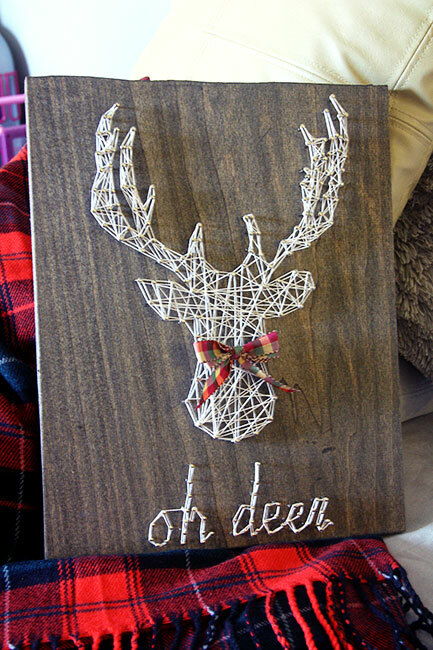 I added a plaid bow to our ‘Oh Deer’ string art sign. You can see the tutorial I made for the ‘Oh Deer’ string art by clicking HERE. 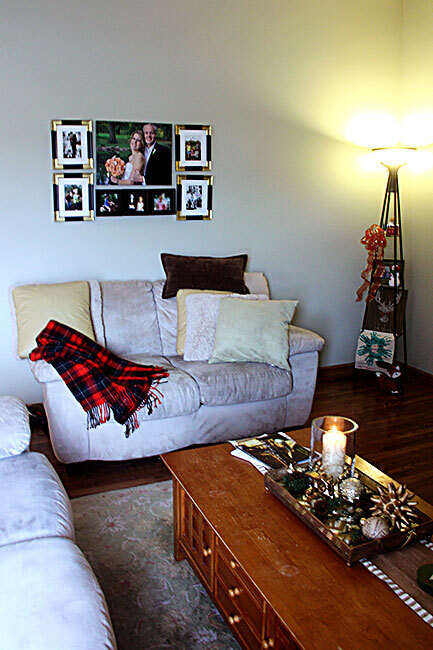 Here is one of the couches in our family room… with a nice plaid throw. 🙂 You’ll see that I made a gallery wall with gold tipped frames (you can find that post HERE). 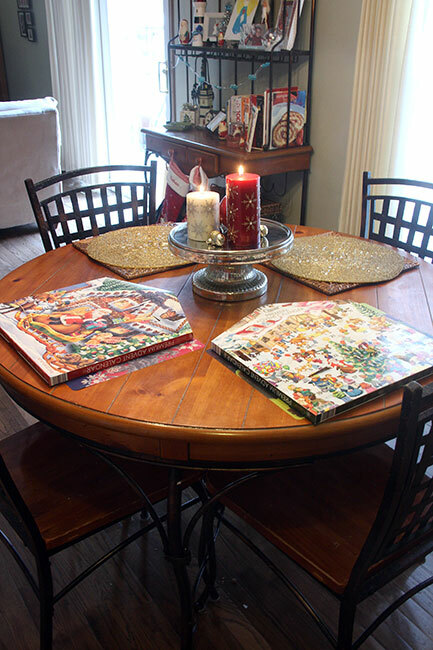 Here is the small table in our kitchen… I usually don’t change out the kids place mats, but I did place their advent calendars on top of them. I have had this silver stand for ages (bought it at Kohls way back) and it is wonderful to place a few candles on with small ornaments. These huge advent calendars are from Aldi’s and were only $5 each… even better, the chocolates aren’t from China, they are from Germany! 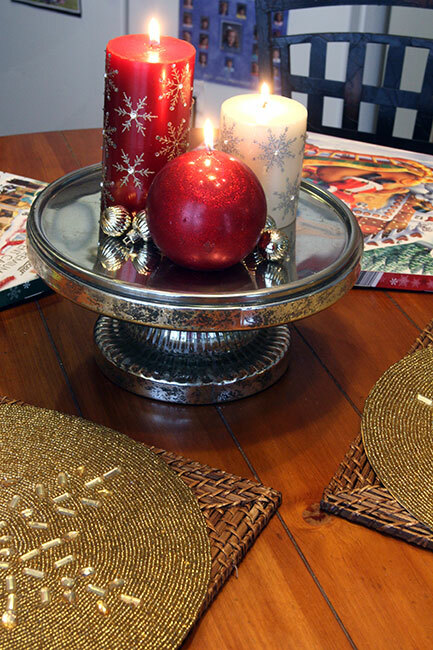 I usually change out the round place mats for every holiday, I purchased these embellished snow flake place mats in gold at Target. 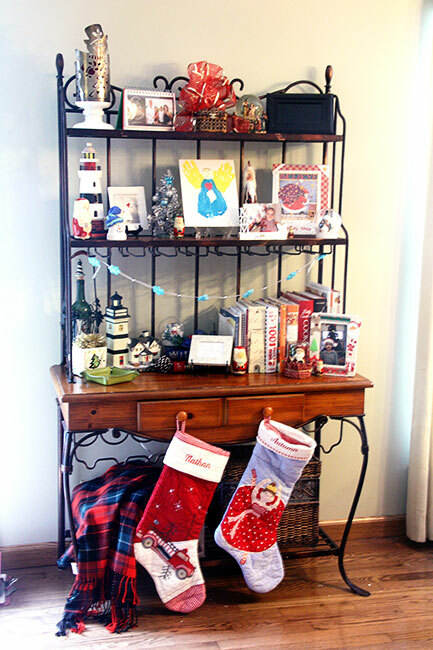 I really don’t think this photo does justice, because the buffet rack is one of my FAVORITE parts of the home to decorate for Christmas… the lighting was really blah when I took these photos, so it was hard to get light inside the home to spruce up everything. Anyway, this is where I set out a lot of my Christmas items that we’ve made or purchased over the years. Well, that is all for now! I still have a couple of Christmas crafts that I will be sharing on the blog before the hustle and bustle of the holidays really hits. Have a safe and Merry Christmas and thanks for stopping by to see my Christmas tour!